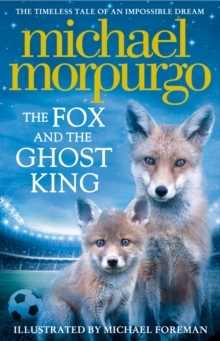 A delightful tale of victory against all odds from master storyteller, Michael Morpurgo, lavishly illustrated by Michael Foreman.”Every fox in the whole town, in the whole country just about, is a football fan… And we all have an impossible dream.”In a cosy den under a garden shed lives a family of foxes. They love to watch football – all foxes do. But their favourite team keeps losing and losing, and it seems like things will never look up.That is, until Daddy Fox finds the ghost of a king, buried underneath a car park. A king who wishes only to be free.”Release me,” says the Ghost King, “and I can do anything. Just tell me your greatest wish.”For these football-loving foxes, might everything be about to change…?